Good food is essential on a boat, that´s common sense. Food gets even more important the longer the cruise. 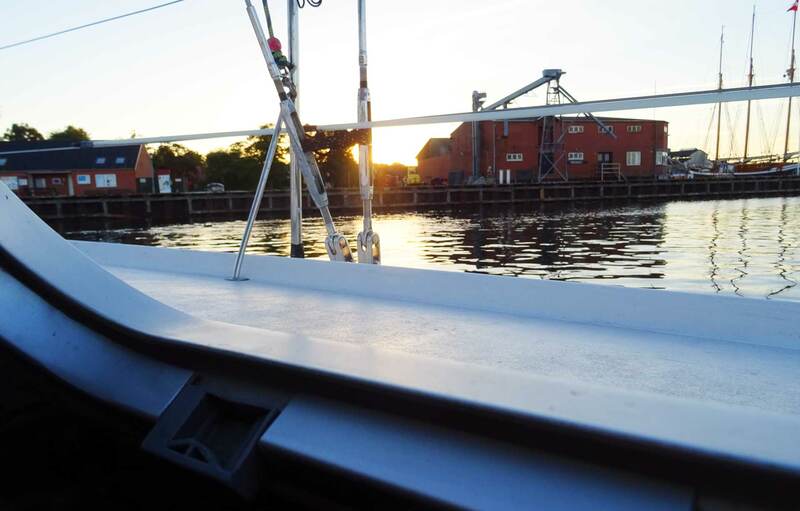 That in mind it was a no brainer for me to seize the position of ships´s cook during my last 7-day-trip on a Pogo 40 Class 40 racing yacht – we were sailing around the Danish Island of Fyn, which can be read in this article here and here. Preparing the dinner turned out to be the major aspect of the day as the crew was so much looking forward to a rich, tasty hot meal after 6, 8 or even 10 long hours of tedious sailing. This time I went Asian. This was due to the fact that three of our crew of six have been vegetarians and I didn´t planned to spent hours in the galley producing two meals. Veggie cooking is not that challenging, but is easiest from my point of view when done in Asian style. 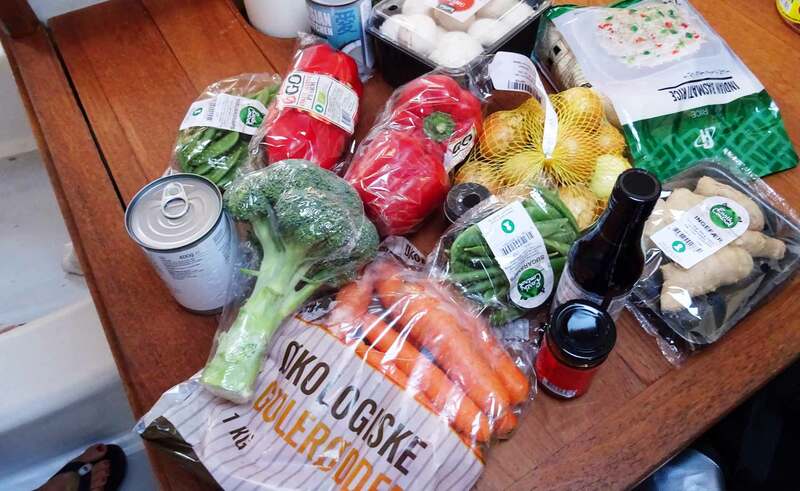 So we left our yacht right after landing to seek for the nearest supermarket and brought home some bags of fresh, mostly organic, vegetables and other ingredients for the Yellow Thai Curry á la Pogo. When it come to a Curry there´s no rules at all. “Curry” does not necessarily depict the very Indian spice, but means something like “put in everything”, as a cook in Mauritius once told me. So there are virtually no limitations to which vegetables you should get for the curry. 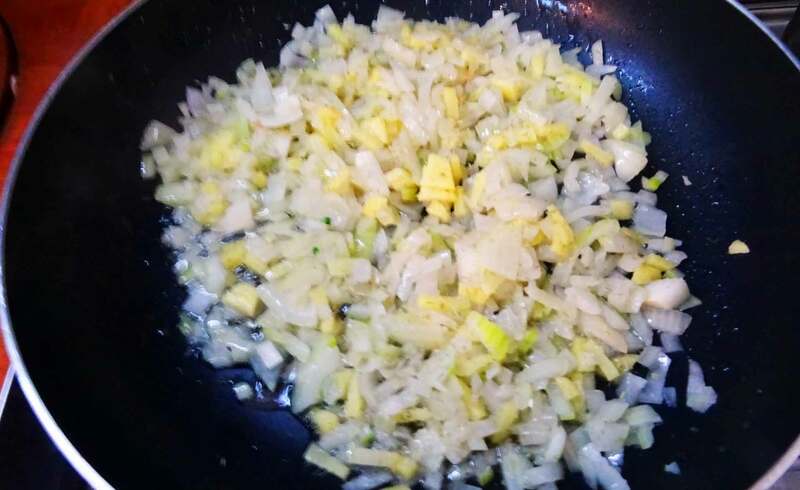 But there are some basic ingredients a Curry shouldn´t miss: This is Onions, Basmati rice, Ginger, Garlic, Coconut milk and Soy Sauce. The rest is up to you and your preference. I further opted for organic Carrots, Red Pepper, Button Mushrooms and tasty, crunchy Snow Peas. First step: Whittling, whittling and whittling. That´s called mis-en-place amongst professional cooks which essentially means that a meal is prepared by first having all ingredients cut and produced in a raw state ready to be cooked. You´ll need a sharp knife, a lot of small bowls for the veggie chips and maybe one assistant: With a second knife. And that´s what we did. It took at least half an hour to have all the veggies cut to size for a hungry six-person crew. If done on your boat, plan well ahead when acting as ship´s cook because long waiting times after a long sailing day isn´t what an exhausted crew will reward you for. Maybe starting the work whilst out on the seas is a good idea: Having everything ready upon landing will reduce cooking time significantly. Well, that decision of course depends on the motion of the ship and other things as well. To motivate the crew, collect some “Aaaaah” and “Wooooow! That smells fantastic!” it is advised to start cooking by gently roasting the essential basic three ingredients: Neatly minced Onion, Garlic and Ginger. This will instantly create a smell, easily recognized along the whole jetty, driving hungry men crazy. That´s because when something is roasted, the so-called “roasted aroma” will be produced, causing human´s gustative nerves to go crazy, pancreatic liquids to flow and mouthes to salivate uncontrollable. But beware: Roasting Onions is an art. Unfortunately most people aren´t patient enough and will ruin the fine taste of an Onion. Onions, Ginger and Garlic. Tons of it. You know what I hate? When a mean consisting of many different ingredients is presented in a way that some of them ingredients are still hot and crispy fresh, some of them on the contrary are boiled to their death, making them mushy, colder than the others. That´s a secret of cooking too: Knowing the cooking times of the different ingredients. Essentially: Stuff with short cooking times will be added to the Curry in a final step, other ingredients with longer cooking times will be added first. That´s why I started to sauté the Red Pepper as it takes a while to get them right. 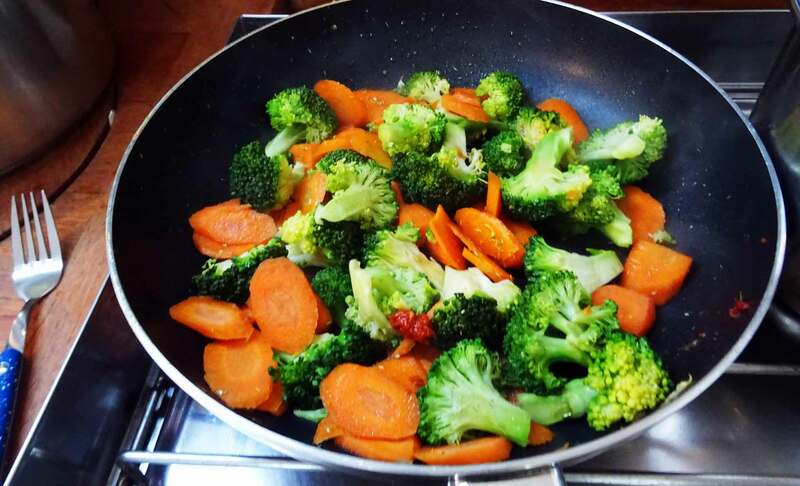 In the same time I brought 1.5 liters of water to a boil, and blanched the Carrots with the Broccoli. Why? Because blanching them to a state of being “medium rare” enables me to have them prepared ready to cook simultaneously without having to utilize another pan. So that´s Onion-Garlic-Ginger first (put it back in a bowl after roasting), Red Pepper second whilst Carrots and Broccoli will be half baked in boiling water for 7-8 minutes. Add copped Sweet Peas shortly before the Carrots are done and have everything sauté for two or three further minutes. To the contrary of roasting onions: Here we need to have heat! Cooking with Propane is Fun. When cooking, I like to work with a system. 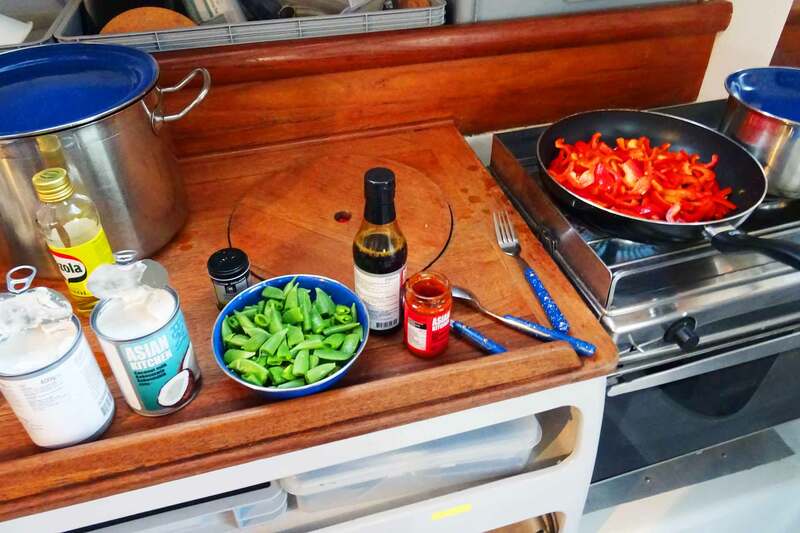 If your sailing yacht´s galley allows you to, you should place the ingredients in the cooking worktop in the order of their application to the meal. So by arranging the small bowls of raw ingredients in a decent order you can work faster, you won´t forget anything and will every time have the control over your work: Just as nice as you would always arrange sheets and other ropes in the sailing yacht´s cockpit, wouldn´t you? 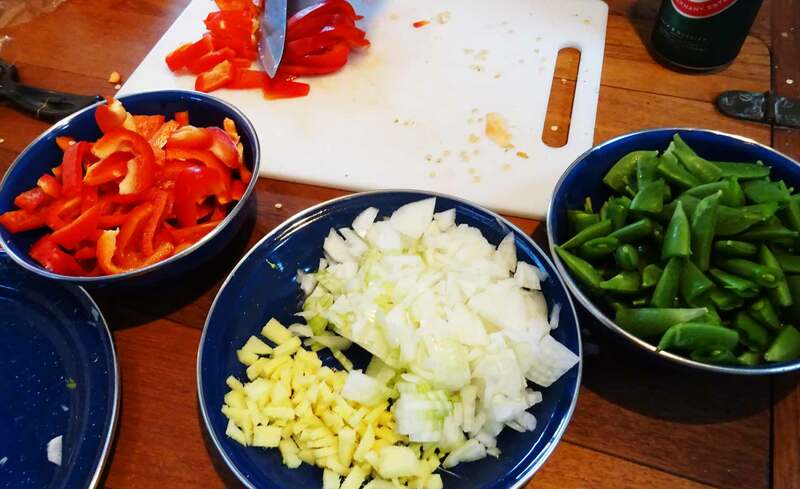 Did I mention that by starting to prepare the veggies, I set up another pot of cold water, twice as much as the amount of rice, and began to prepare the Basmati rice simultaneously. 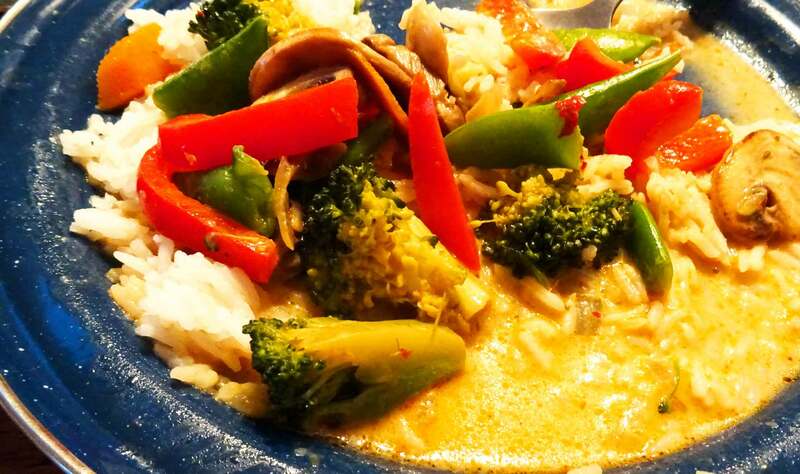 No Thai Curry without Soy Sauce and Spices! Doing Thai Cuisine may appear as easy as ABC, but there are some things that must not be missed. This is Soy Sauce (instead of Salt for the Asian taste) and Thai spices, which could be added in form of dry flavors, spicy cream (as it is the case with my dinner here) or fresh spices like Thai Basil, lots of fresh Cilantro, Spring Onions, hot Chilly and so on. Getting a readymade paste is the most convenient way and will perfectly do on a yacht, although I´d prefer the fresh variant over industrial made stuff at home. Upon having done the roasting of all veggie ingredients you´ll get the biggest pan available on the yacht and fire up the stove. Add in the following order: Onion-Garlic-Ginger (best done when adding a splash of Peanut oil). Let it heat up, then add Carrots, Broccoli, Sweet Peas and Red Pepper and stir-fry with a lot of heat, reduce the amount of fire and add the Coconut Milk. Upon getting the whole to a boil, add the spices. The last you´ll pour into the pot is the slices of mushrooms as this ingredient hardly needs any cooking time at all. Have everything heat up properly: When done neatly, the Curry will be ready to be served just in time with the rice. 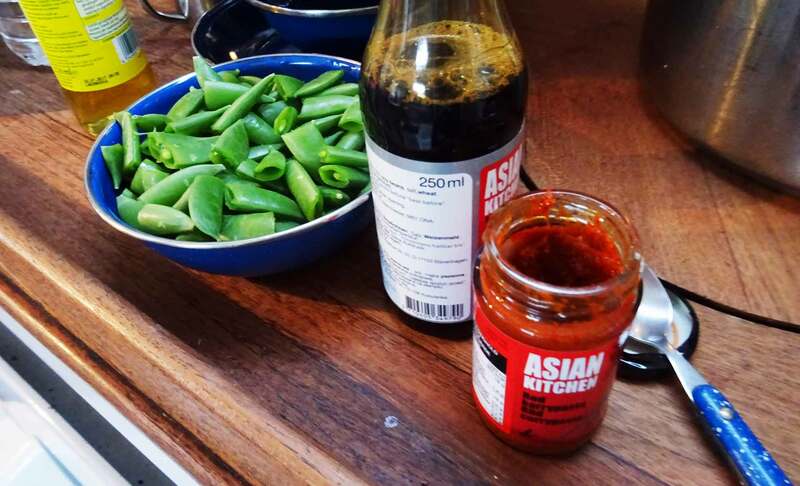 You may add salt by pouring some Soy Sauce (no “western” salt in Asian food! ), spice or hotness by adding chili flakes. Bon appetite! Yellow Curry and Curry of all kinds are just perfect for filling the stomachs of your crew: Easiest to prepare with least usage of precious energy. It´s fresh, tasty and is best served with an ice cold beer.